But, I have an error message : "No models were found". But I opened my stratigraphic model with rockplot 3D (Cf Attached Files). The Model Reveal animation tool works with solid (block) models only, not with grid-based stratigraphy models. The Model Reveal tool basically strips layers of voxels from the display along the selected axes, then builds the layers back on before moving on to the next selected axis, storing the frames in an animation. It is possible to save your stratigraphy model (which is made of stacked grid models) as a solid model, and then you could use the Model Reveal tool. One method is to use the Save Numeric Model checkbox in the Stratigraphy | Model menu to save an RwMod version of your stacked grid surfaces during interpolation of the stratigraphy model. This .RwMod file is not displayed at that time, so to display the strat solid, just double-clicking on the RwMod file name in the Project Manager, choose All Voxels as the display type, and (once the scene is displayed) change the Color Scheme to link to the stratigraphy types table. 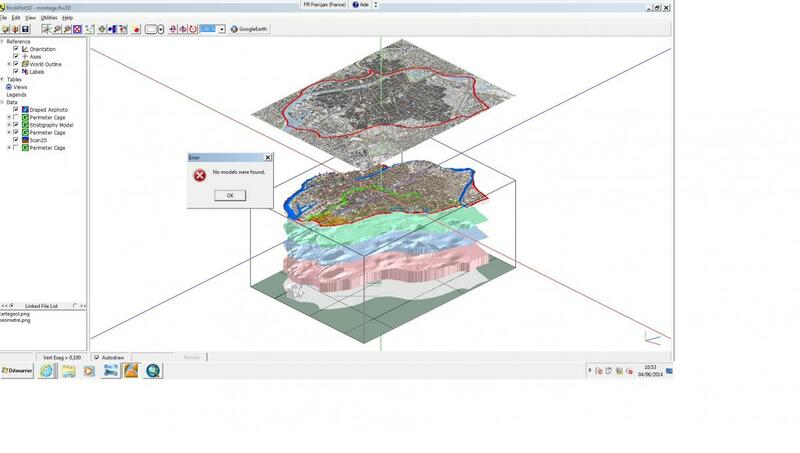 Or, if your goal is to display the grid-based stratigraphy model, and to turn off the display of successive formations - the whole unit - in the animation, you could do this, albeit tediously, by exporting each view as a JPG (File | Export menu), listing these JPG names in the Utilities datasheet, and using the Imagery | Picshow program to create an animation.